Voluntary Work by Daniel F.
On August 10th I set out towards Zambia for the second time. After more than 28 hours of traveling I arrived tired but in good spirit and health at Ndola Airport. 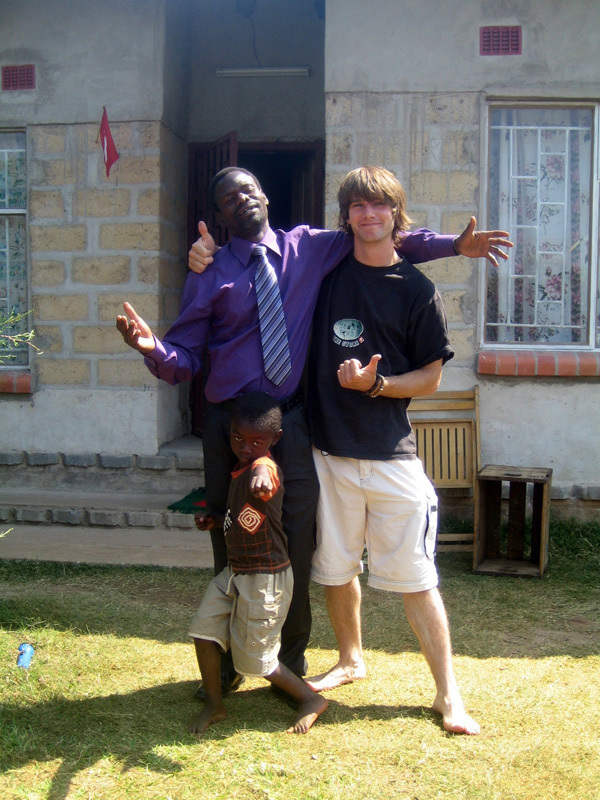 Already during summer of 2008 I had the opportunity to visit Ndola for one month and participate in the construction of a third classroom as well as a library for the Mackenzie Community School. The roof of the new classroom, however, did not get finished until July of this year, as the charitable organization which originally had started the project in Mackenzie had run out of funds. Ultimately, completion of the roof and thus the new school tract was made possible by generous donations from the congregations in Lohn/Stetten/Buettenhard and Oberhallau as well as many private donors. Finishing touches, like plastering the walls and evening out the floor, assembling bookshelves for the library and desks and pews for the classroom, were completed in time for the inauguration of the new classroom at the start of the new school year on September 6th. The many changes and improvements at the Mackenzie Community School, which took place within a relatively short period of time, have now also succeeded in directing the attention of the Zambian governments towards the Mackenzie Community in general. Plans are being prepared which would put clean water as well as electricity supply infrastructure in the slum. Family and friends of Claire took it upon themselves to fund the construction of suitable accommodations for project team members, called 'Malaika Home'. 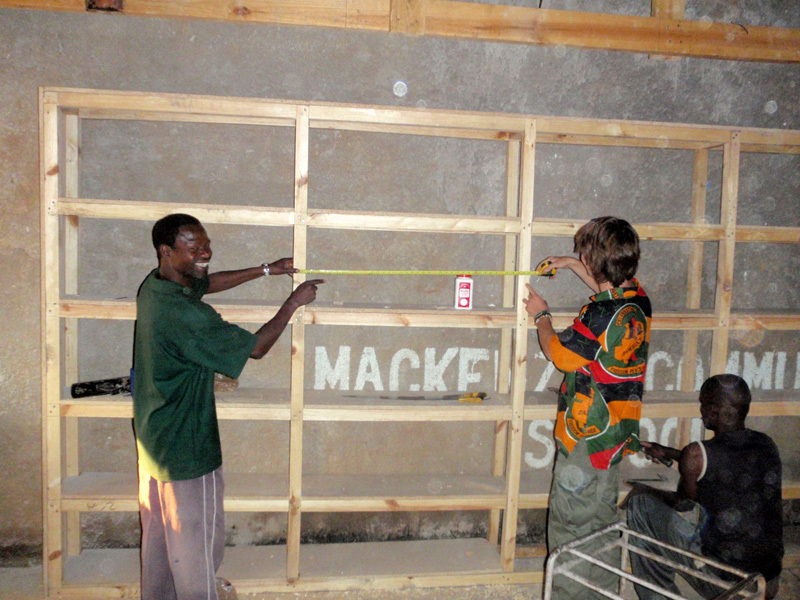 Going forward, Malaika Home will be available and open to accommodate volunteers. In addition, with Malaika Home already being connected to the electric grid, computer lessons will take place there in the future as well. The provision of so-called microcredits is often seen as one of the most effective strategies to battle global poverty. Microcredits enable families to start small business activities, allowing them to support themselves. We started a trial micro-credit program with six participants from the Mackenzie-Slum in August. Loans are repaid with interest and funds can thus be reinvested for new microcredits. In this fashion, the 'value' of each initial dollar in the program grows and the number of families which can be supported via such micro-loans increases. In the city of Kabwe I worked in collaboration with the non-governmental organizations BOCCS and Life Trust at the Aids-Orphanage & School project there. At this point, eight schools are operated under this program, one in the center of Kabwe proper, and seven in slum-like neighborhoods around the city. More than 4,000 pupils attend these schools; in addition, throughout the eight schools 400 kids receive daily meals under the 'Meal Assistance Program'. 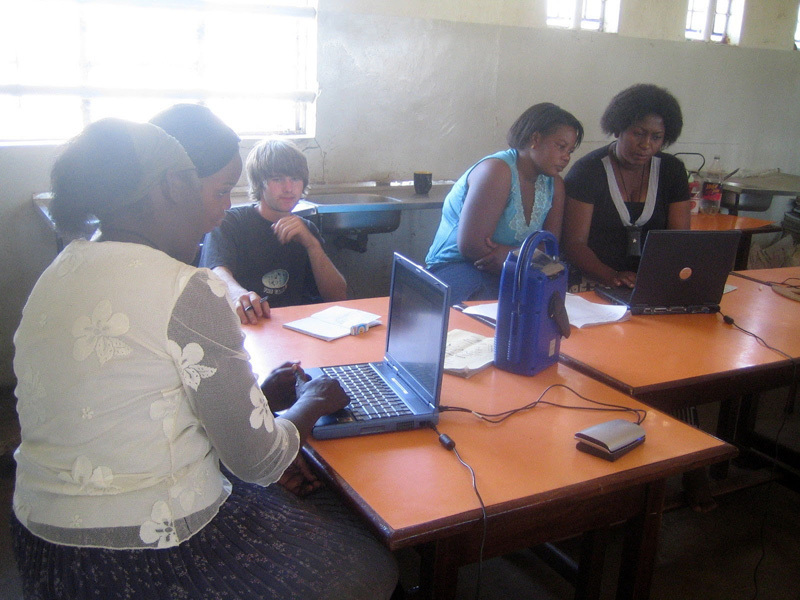 At the beginning of September ten computers were installed in the 'Kabwe Main' school for teaching purposes. As a result, my main responsibility became to provide introductory computer courses for students and teachers alike. In addition, I was asked to develop and document a suitable IT Training curriculum in English. Almost no paid job opportunities exist in Mpanshya, resulting in sky-high poverty levels there. After finishing school, graduates have next to no opportunities for vocational training in order to start a career. It is this challenging situation which the Bethlehem Mission Immensee is working to address. By operating a training center for wood- and metalworking skills, participants are provided with the perspective of starting their own business or find career opportunities in town. In the hospital of Mpanshya I firsthand experienced how the epidemic spread of Aids can eradicate complete families. Overall Aids-infection rates in Zambia are estimated to be around 25 – 30% of the population. While Zambia has a total population of 11.7 million, in 2005 already 1.13 million of them were infected and/or afflicted by Aids. As Aids weakens a human's overall immune system, it is safe to assume that Aids is also the underlying cause of death in many other situations, e.g. Malaria. While officially Malaria is listed as cause of death, in the end it is that person's immune system weakened by Aids which ultimately caused the secondary Malaria-infection to result in death. Average life expectancy for a newborn baby in Zambia these days is 33 years. Even more shocking is the fact that it has decreased from 44 years to 33 years in only a matter of one decade. As a result, Zambia today has one of the lowest life-expectancies in the world. An estimated 630,000 children in Zambia have lost at least one parent due to Aids. Following local cultural traditions, Aids orphans are usually taken in by the family of their uncle or grandparents. Due to often pre-existing unemployment and poverty, the additional responsibility for these orphans poses fundamental problems for many of these families. As result it is particular Aids orphans who suffer from malnutrition, are being abused or used as forced labor, preventing them from attending school. At this point, many extended African families have no further capacity to care for new Aids orphans. Many of them only find temporary shelter with their families and are then on their own. Many of them have no choice than to grow up in overcrowded orphanages or on the street, where they often fall victim of sexual abuse or neglect. Aids thus most fundamentally affects children, who did not bring this upon themselves and are left with no choices. During my teaching activities I realized how broad and fundamental the impact of Aids is, even for those not infected. Many a times pupils missed a whole week of school as they had to care for infected and sick parents or siblings. When attempting to talk to them about their situation, many simply broke down in tears due the hopelessness of their situation. Many Aids-orphans have to work simply in order to survive and cannot afford the tuition for a public school. As a result it is exactly in the most affected areas of town where public schools are more and more losing their reach and effectiveness in the crucial area of Aids awareness and prevention education. In the name of all my friends here in Zambia I thus would like to thank you all for your generous and ongoing support!